For those patients that have what is colloquially known as ‘bat wings,’ undergoing an arm lift is probably the best way to get rid of it. These so called ‘bat wings’ are nothing more than loose excess skin that jiggles back and forth when the arms move. The cause can be one of two things. The first one is age. As we get older our skin tends to lose its elasticity. Secondly, we also tend to lose some body volume. When you combine the two you get excess skin that doesn’t contract as the underlying volume of tissue disappears. As a result you get flabby loose skin that many find to be unsightly. 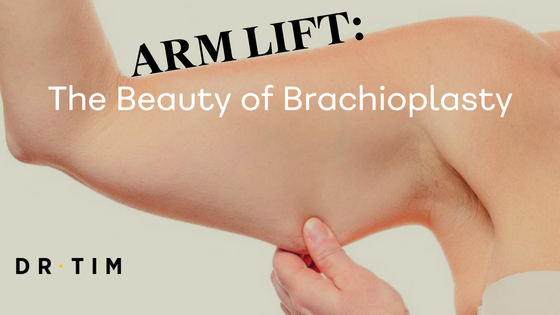 The cosmetic procedure known as an arm lift, officially known as a brachioplasty, removes the loose excess skin. Liposuction (CoolSculpting can be used as well depending on the surgeon’s opinion) may also be performed in conjunction with the brachioplasty to assist in removing stubborn fat, resulting in a more refined arm contour. Once the excess hanging skin is removed, the arm is sutured tightly leaving a firm arm devoid of any flabbiness. There are a number of different procedures when it comes to arm lifts. The type of procedure performed depends on the patient themselves. This is because every person has varying degrees of skin laxity and flab in the arms which means they may not all need the same type of procedure. It also depends on what they like and the results that they are looking for. Elbow to Axilla – In this procedure an incision is made from the fold of the elbow to the axilla or armpit. Liposuction is often used in conjunction with this procedure. The liposuction is used to remove stubborn deposits of fat that give the arm a better final contour. This is a widely common procedure chosen by many patients. Mini Arm Lift – This procedure is for those who have excess skin mostly in the upper portion of the arm. It is also for those who don’t want a lot of scarring which can happen in the procedure above. Here, the incision is made under the armpit only. Arm and Axillary Lift – For those who have too much excess skin in the upper arm and armpits this procedure is for you. This procedure gets rid of the sagging skin from the upper arm and from the armpit as well. The incisions are usually done in two places – the upper arm and under the armpit onto the chest. Elbow Lifts – This procedure is just what is says: a lifting of the elbow portion of the arm. Some people will have loose and sagging skin over their elbows. This procedure is targeted just for that portion of the arm. Liposuction – If you still have elastic skin then you may not need to have a lift at all. For patients like this, liposuction may just be the solution. With liposuction the incisions are not that dramatic (only 3-4mm long) which means scarring is kept to a minimum. Typically a likely arm lift candidate is one that has lost a lot of body weight. This means that they have lost a lot of body volume that resulted in the excess skin that was not able to adapt quickly to the loss of volume underneath it. It is highly recommended that you be at your target weight before the operation. If you are still in the process of losing weight you should wait until you hit that weight plateau in order to get a good final result from the arm lift. There’s a good reason for this. If you have the procedure and still lose the weight you may find that your arm will still have flabbiness in it even after the operation. That’s because since you still had weight to lose the skin is still stretched out resulting in the extra, loose skin. It is a good idea to consult with a plastic surgeon when you want to have this cosmetic procedure done. This way the procedure can be explained to you including what you can expect, how your recovery will be and the risks that are involved. For further information call us on 13000DRTIM or email us on info@drtim.com.au.